Manufactured in Allemagne from 1949 until 0. Lippische whose full name is Lippische Kamerafabrik Richter und Fischer GmbH is often known by the diminutive of Lipca. When I say known, it's all relative, because this immediate postwar manufacturer has not produced many different models. The best known is probably the Rollop found occasionally in France. 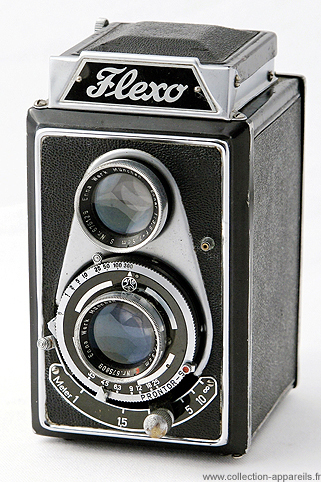 The Flexo is a 6 x 6 twin-lens reflex, the only original feature of which is the setting of the focus. It is done by laterally moving the cursor that is below the shooting lens. 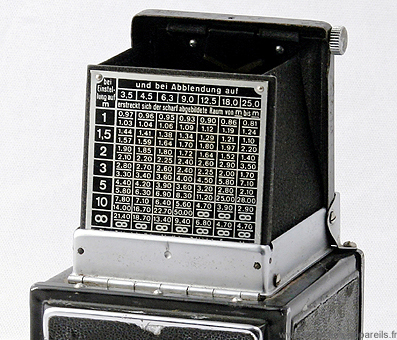 Both lens move together back and forth, but not the visible lens plate. The shutter is a classic German of the moment, ie a Prontor S (1/300). The lenses are less common, they are Enna from Munich.